So, I was reading an article on MSN the other day that said (and I am seriously not making this up!) that it was good to have dessert for breakfast. And you are going to need your energy today because we have an action-packed Wednesday! 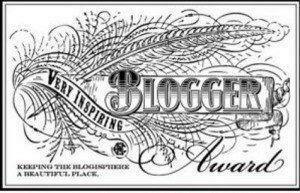 First, I am honored to say that I have received the Very Inspiring Blogger Award from the lovely and talented Tina DC Hayes! Next on our action-packed schedule, we have Straight From The Editor for the December Pitch Pick. Pearl is a tiny grain of sand that lives in the bottom of the ocean. She feels insignificant in her world and both envious AND enamored of the star that she can see far above her. As she sets her sights on joining the star, she encounters many challenges... until finally, one night, she meets Oyster, who helps her become a star of her own. Cute idea! I would make two small changes. One at the end . . .”who helps her become a star in her own right.” Because she doesn’t literally become a star and “of her own” sounds like she’s got a star. You want to get across that she transforms (like a butterfly) into something special a jewel of the sea – a pearl. And it seems odd that her name is Pearl but that’s what she becomes. I would give her another name or else it gives away the ending right away. Maybe something like Little or Tiny or something to emphasize the insignificance she feels. I always find her comments so insightful! Next (no rest for the wicked 🙂 – go back and have another slice of cake if you need further fortification :)) we have today’s pitch which comes to us from our friend Julie, whose previous pitch for Eddie Brick Visits The Aunts you may remember from December. A scribbler of children’s stories in between chores, Julie Rowan-Zoch has visited three continents, attempted to learn 4 languages, and has a 2-3-3-3-3 phalangeal formula in both of her hands and feet. (Though not yet able to get a good grip with her toes, she has been drawing with her hands since she exchanged a banana for a crayon.) Please come visit her on her blog and view her beautiful artwork (some of which is featured in my PB writing course :))! The Pitch: Pip the mouse longs to be a cowboy, and does his best to rustle up some skills. His mother gets kinda ornery though, as Pip’s attempts turn the household on its head. But that doesn’t sour his milk, and neither does the neighbor’s cat! Please send YOUR pitches for the coming weeks! For rules and where to submit, click on this link Would You Read It or on the Would You Read It tab in the bar above. There are openings in March, so we could really use some new pitches! It’s your chance to be read by editor Erin Molta! IT’S GROUNDHOG DAY!!! – Early Spring Or Six More Weeks? Perfect Picture Book Friday – The Boy Who Cried Bigfoot! Thanks Hannah – I appreciate 'comma sense'! Absolutely, Genevieve – it is your body crying out for a health regimen 🙂 And thank you for your helpful comments for Julie! Hmmm…. maybe next week we should have tiramisu for WYRI…! 🙂 Thanks for your very thoughtful comments for Julie, Teresa! Thanks for your help, Pat, and glad you liked Erin's comments! I'm going to send you one of those plastic baby bibs with the trough at the bottom 🙂 (which I thought were completely revolting and my sister-in-law loved :)) And yes, I thought that was a very good point too! Thanks for chiming in for Ms. Rowan-Zoch, Erik, and I'm glad you find the editorial comments helpful!